So many things change every year, but I always know exactly where I will be on the first Saturday of August! My dad's family has been gathering for a family reunion on the first Saturday of August for decades. 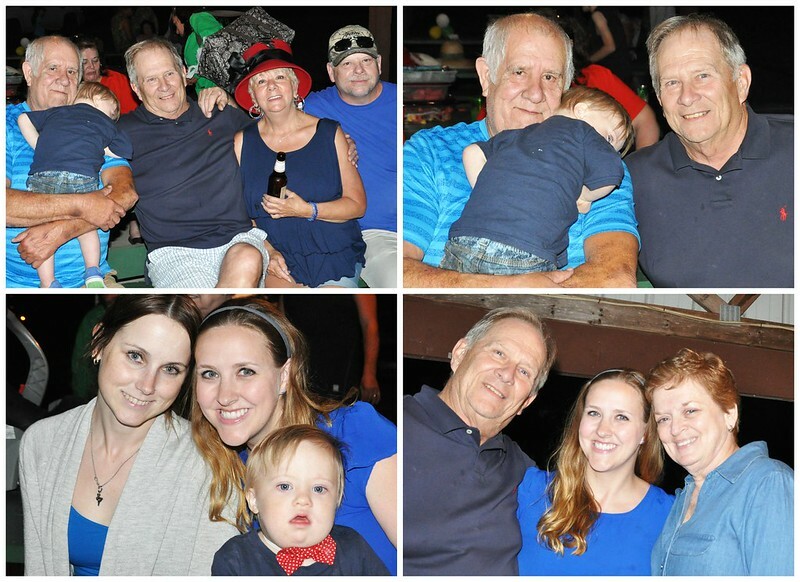 This year, it happened to be on August 1st, and it was extra special, because my family from Texas was in town! My dad has a HUGE family. Not only that, but they are a fun, loving, supportive family. It's always so nice to see them. Although the majority of us live in the same general area, I only get to see my extended family once a year. It's definitely not enough! 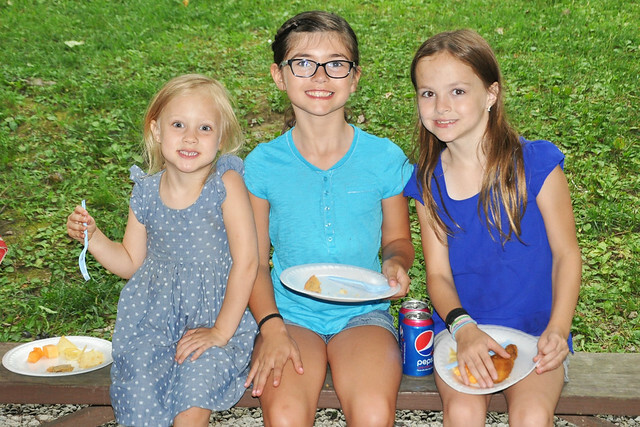 We had a lot of fun at the reunion this year! It was held at a park right next to my parent's house, and everyone seemed to enjoy having it there. There was delicious food. That's a given! 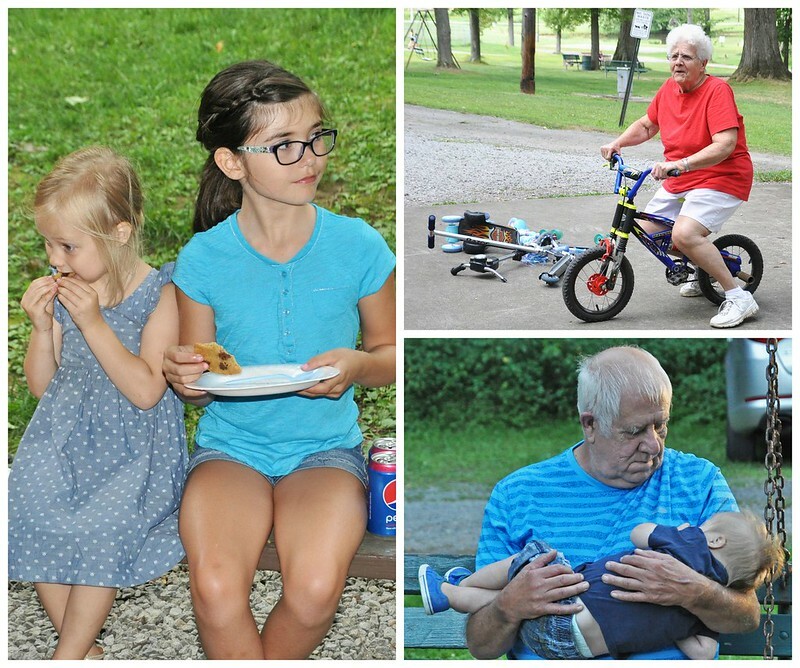 Everyone just kept eating, the matriarch of the family rode Lexie's bike, and my dad repeatedly put Liam to sleep. Liam showed everyone his creepy trick of sleeping with his eyes open. 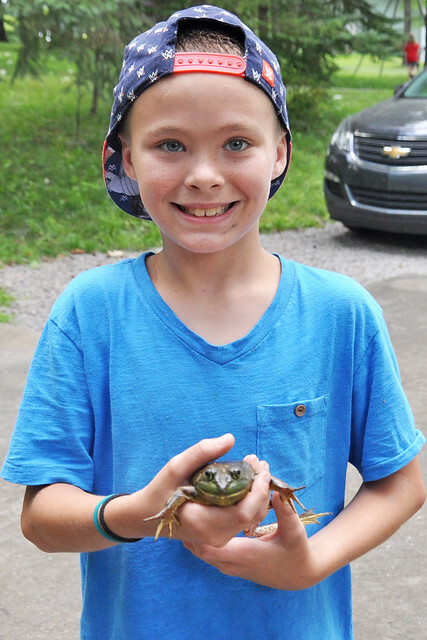 ...and a REALLY big frog! 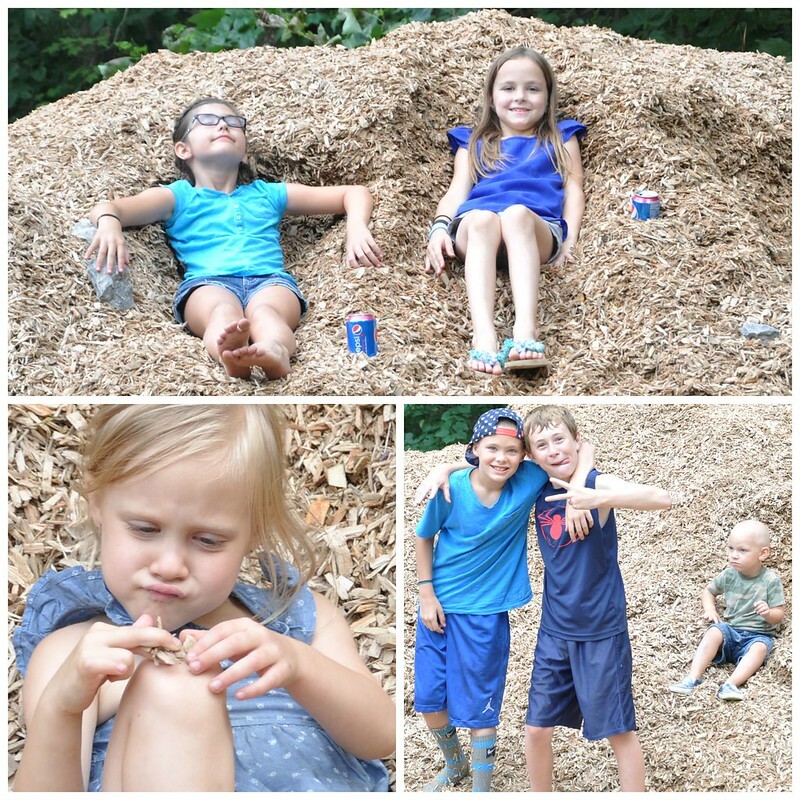 The kids spent the day playing in a ginormous pile of mulch. 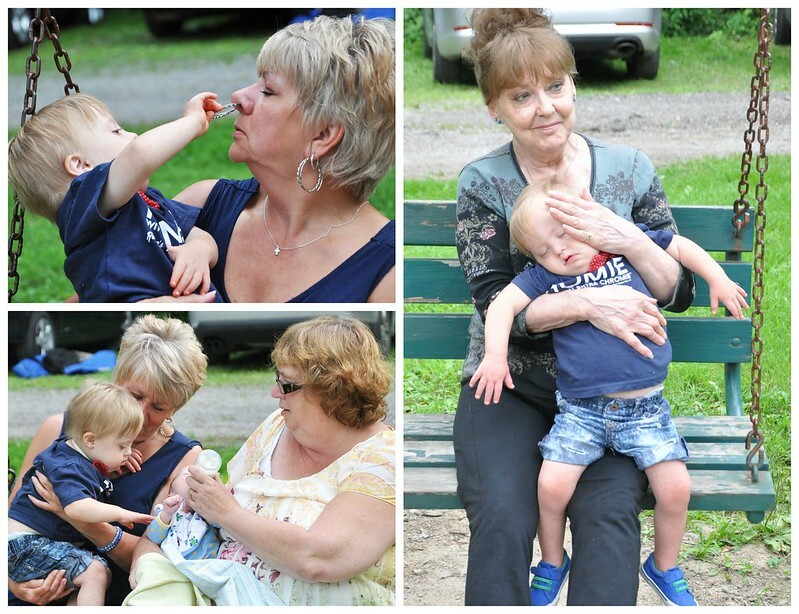 Liam shoved an earring up Great Aunt Jackie's nose, met a distant baby cousin, and fell asleep (again) on my mom. 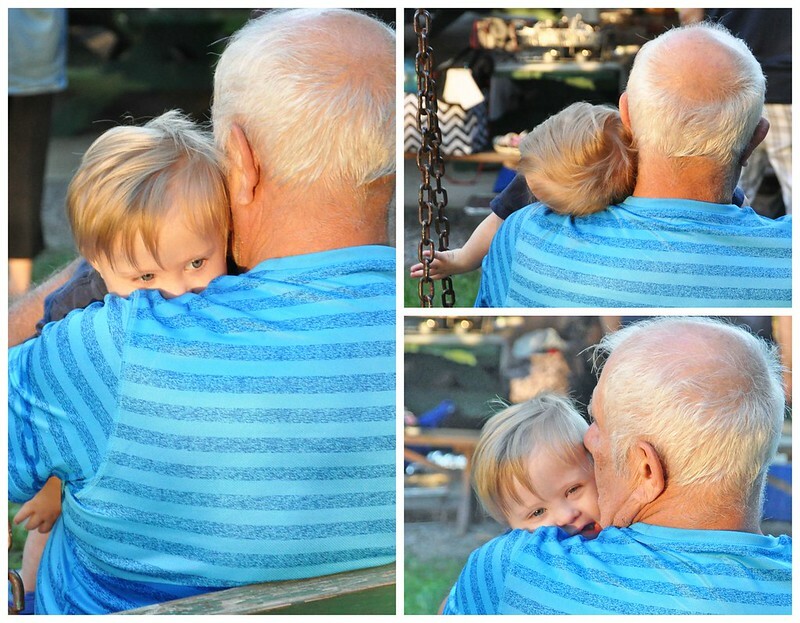 When he woke up, he spent some time in the coolest swing ever and bonded with Great Uncle Milt from Texas! 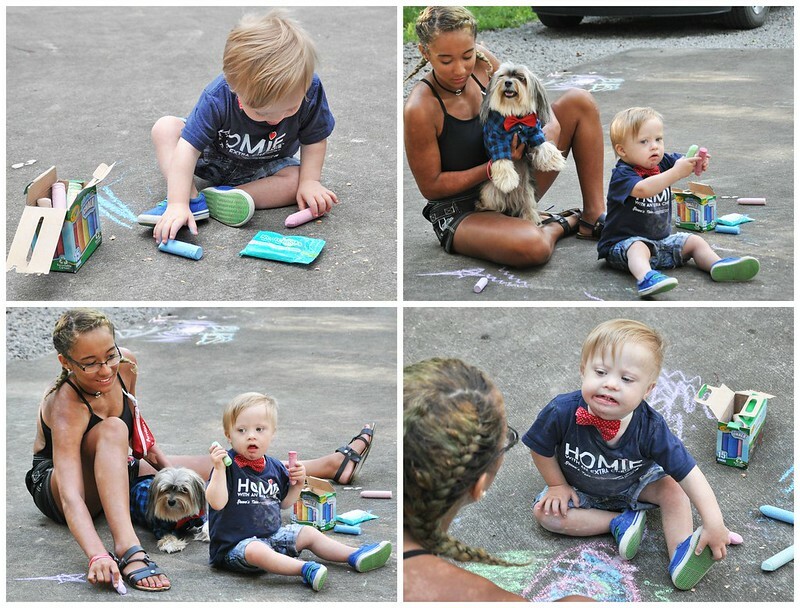 When he tired of that, he moved on to sidewalk chalk with his beautiful cousin, Julia, and the bow-tie wearing dog. They totally coordinated! All that sleeping was for a reason. Unfortunately, Liam was really out of sorts that day. 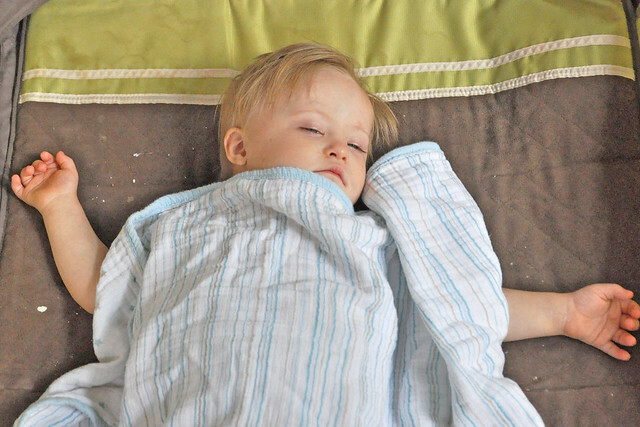 Teething and diarrhea was making him feel awful. 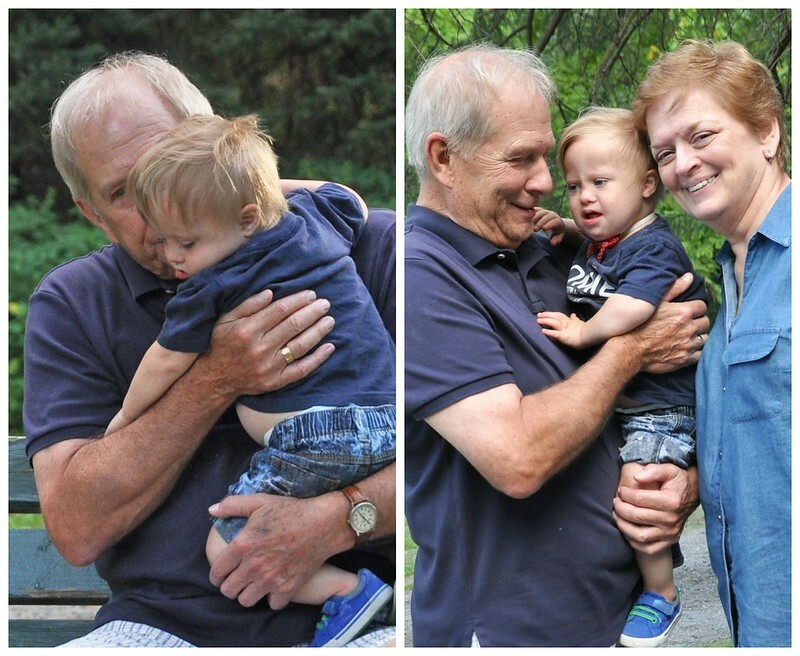 I felt terrible, because it was the first time my aunt and uncle got to meet him. 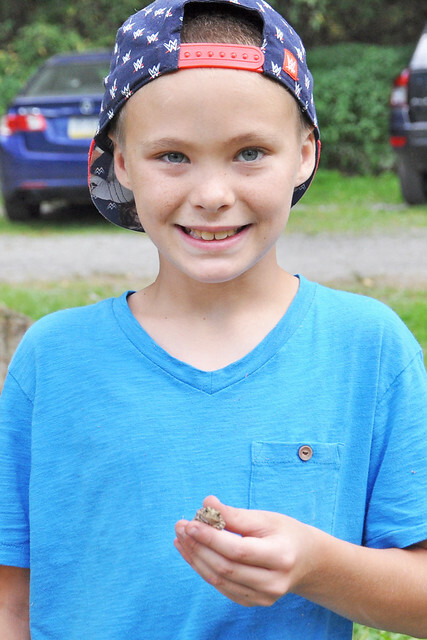 Despite the fussiness, he still had his moments of sweetness, and they were smitten! The sun began to set, which meant it was almost time to say goodbye. Saying goodbye is always so hard. It's hard enough knowing I won't see most of my relatives until the following August. BUT..we went two years between visits with my Godparents and my cousin from Texas. Everyone is just so happy and excited when they come home. We don't get to see them nearly enough and it was so difficult saying goodbye! 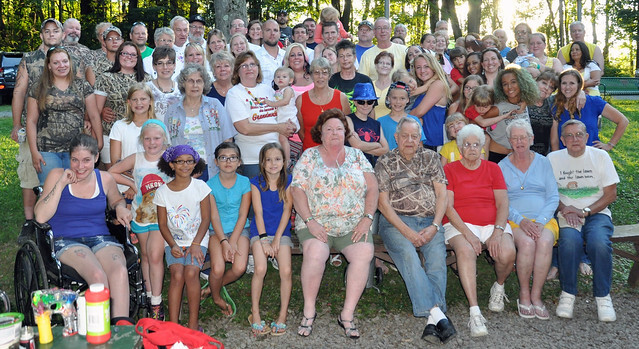 Do you have a family reunion every year? So much fun that you have a consistent reunion. I pretty much have zero family so reunions are always something that I am a bit jealous of. Glad you had a great time. 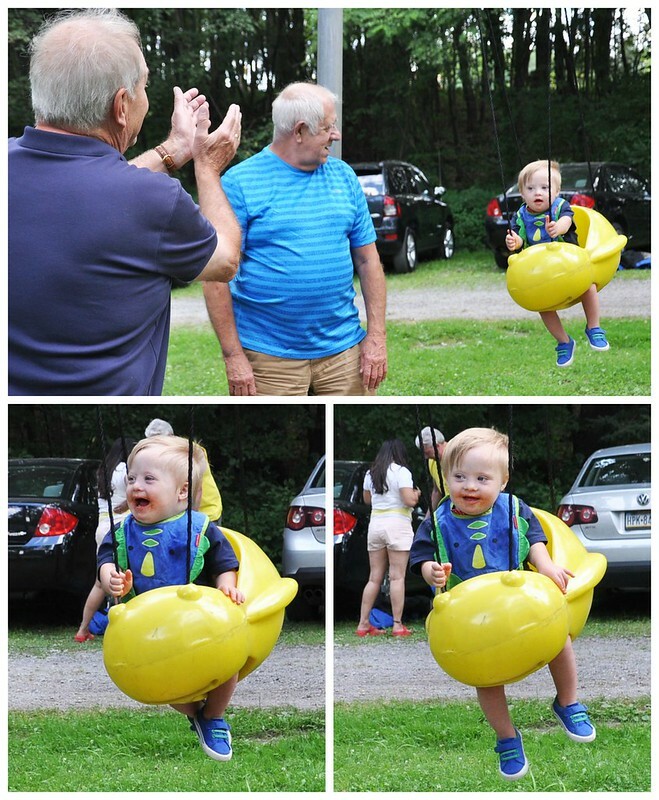 Fun, looks like a great time. How much fun! We have a big family reunion coming up on Labor Day weekend. I went to them all of the time as a kid, but this will be the first opportunity for us to bring our whole family of 6. I'm excited. Wow, that's a big family! The kids must have had so much fun playing with each other! How cool to be able to look forward to this family reunion every August!